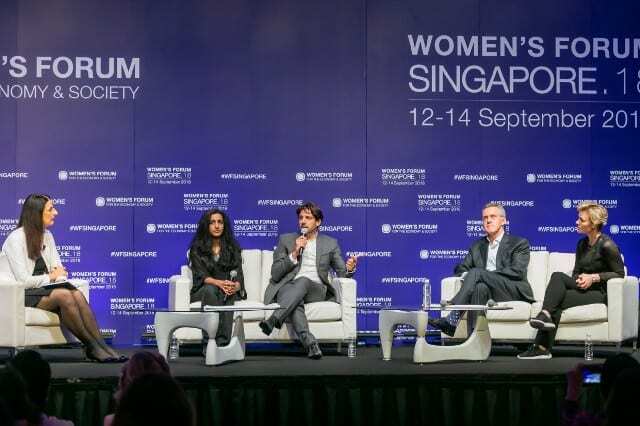 This distinguished panel of AI experts Margherita Pagani, Professor of Digital Marketing, Emlyon Business School; Ayesha Khanna, CEO, ADDO AI; Steve Leonard, CEO, SGInnovate; Karin Nilsdotter, CEO, Spaceport Sweden; Pierre Robinet, Senior Consulting Partner, Ogilvy Consulting; shared valuable insights on how AI is impacting society, particularly in emerging economies. All panelists believed that AI can deliver significant benefits to society and Khanna pointed out that now is the time for Asia to leapfrog and help the uneducated and underemployed in emerging economies. For instance, big data can help provide health and education services and even the farmers in Asia. There is a role for AI to not only transform Asia, but to create sustainable development. Robinet explained that in order to reap the benefits of AI we need to understand the significant changes that are taking place in the emerging economies. Research conducted on 12 emerging economies, including Bangladesh and Mexico, show that there is rapid urbanisation, an increase in non-communicable disease like diabetes, and an increase in women entering the workforce. These factors will shape the future AI strategies. The key takeaway from this session is that AI can provide better infrastructure and connectivity, and better education and health services in emerging countries, like Africa which has a lot of potential. This can be achieved by: providing access to the internet; having diversity; good leadership; and investment in education. Nilsdotter shared that the Fourth Industrial revolution needs “agile and innovative teams” and “diverse teams”. Further, leadership is the key enabler to attract the best talent to the organisation. However, government has a key role to play in investing in education. Khanna agreed that education is important and that in Singapore there will be free courses for girls to learn the basics of AI. Robinet said that increasing digital literacy amongst women can help make men understand what technology can bring to society. Further, more diversity in algorithms can help bring goods to emerging markets faster.